HOUSTON (October 29, 2018) – Three weeks following the successful launch of his Pretty in Pink program, Texans Defensive Back Kareem Jackson hosted his second annual Dinner for a Difference celebrity fundraising event. The Monday evening event was presented by Woodforest Bank and The Briar Club and held at The Four Seasons Hotel in Houston – the same venue that hosted Pretty in Pink. Dinner for a Difference featured an exclusive cocktail reception, valet parking, and a three-course dinner. Several Texans players – including Tyrann Mathieu, Jonathan Joseph, Whitney Mercilus, and Vyncint Smith – attended the event in support of their teammate, mingling with the 150 fans and foundation supporters in attendance. Attendees were also treated to an exciting live auction that offered once-in-a-lifetime trips and experiences as well as an ongoing silent auction throughout the event, where rare sports and music memorabilia were bid on. 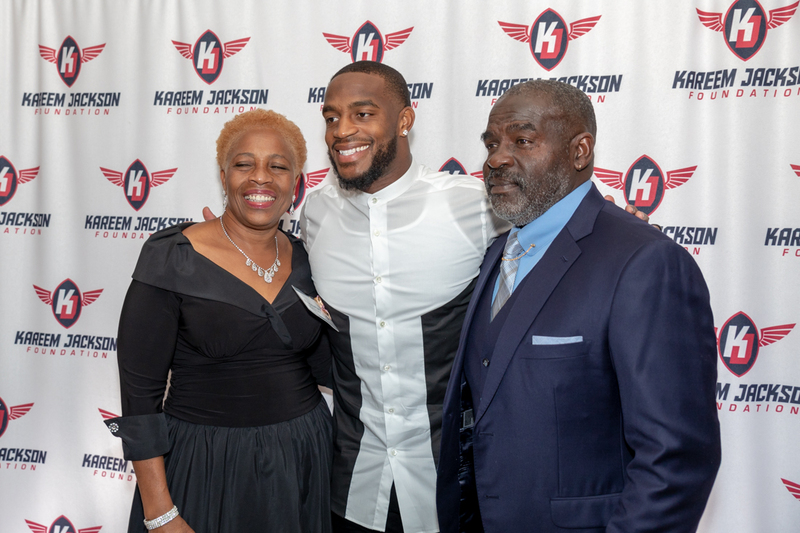 Through the auction, sponsorships, ticket sales, and donations, Dinner for a Difference was successful in raising over $207,000 in support of the Kareem Jackson Foundation, including a $15,000 donation from Kareem himself. Proceeds from the evening’s festivities will go on to benefit Kareem’s outreach programs, such as Christmas in July and the aforementioned Pretty in Pink. During the event, Kareem spoke at length about the inspiration for his foundation and the importance of its mission, which is to provide assistance to women with breast cancer and children struggling with pediatric cancer. Both illnesses are very personal to Kareem, as he watched his mother battle and overcome breast cancer twice in her life. Additionally, Kareem’s sister battled leukemia as a child, which she ultimately overcame as well. These personal, eye-opening experiences motivated Kareem to establish a foundation that helps women and children who battled cancer just like his mother and sister did. “I’m so grateful to my teammates, board members and guests who came out to support my fundraiser. The money we raised tonight will go toward expanding the programs that my foundation organizes to give hope to cancer patients,” Jackson stated during the event. Dinner for a Difference continues what has been a busy first full year of programming and fundraising for the Kareem Jackson Foundation. In May, Kareem hosted Tee-Up with Texans at a local TopGolf, raising $74,000 in support of his Foundation. Additionally, he also launched his first ever outreach programs, Christmas in July and Pretty in Pink. The $207,000 raised at Dinner for a Difference, including Kareem’s personal donation of $15,000, will allow for these programs to continue to grow in 2019. The mission of the Kareem Jackson Foundation is to provide opportunities and resources to families with children battling cancer and women battling breast cancer.